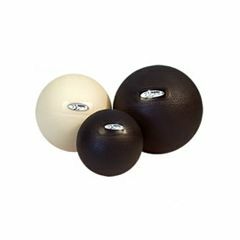 Fitball Body Therapy Ball 6"
The 6" FitBALL Body Therapy Ball offers optimum support and comfort while providing steady counter-pressure. These compact balls are used to stretch and release tension in muscular tissue in the pelvic, hip, lower back, middle back, neck, chest and shoulder areas. This 6" ball offers intermediate usage. Needle pump is required to fill the ball up. Targets Muscles. Multifunctional. Sturdy. Compact. Easy To Use. Pain management. General Fitness. Stretching. I use this ball like a massage therapy tool to target tight back muscles, get pain relief, and enhance flexibility. The degree of inflation is adjustable. I think I might take some air out so that it's more comfortable to put my whole body weight on it. Sturdy Construction. Gym Quality. Versatile. Good Grip.